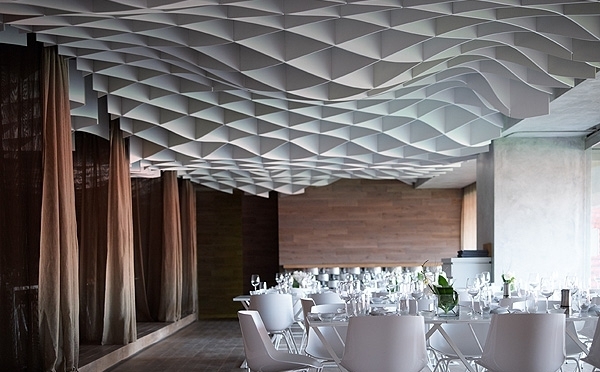 The wave of the sea inspired this masterful canopy designed by LM Architects. Located in the restaurant at Karaiskaki Stadium, this design carries the conceptual prerequisite in the design proposal, which was flowing water. The design itself has the illusion of movement. This optical enhancement, created utilizing the style of parametric design, dominates the environment and gives identity to the restaurant. Not only does this construction act as eye candy, it also conceals the structural elements within the ceiling. Although produced in a hard-construction technique, this design showcases flowing, organic lines and a vivid likeness to the original inspiration.